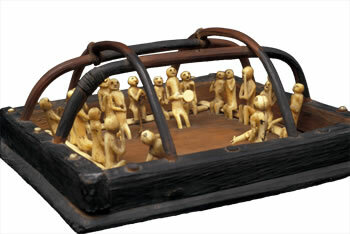 Qasgiruaq/Qasgi model from the Kuskokwim. Ik'atak (Julia K. Paul), wearing a beaded head dress, accompanied by Asgiilleq and Nagyuk modeling dance headdresses topped with caribou throat hair, Kipnuk. 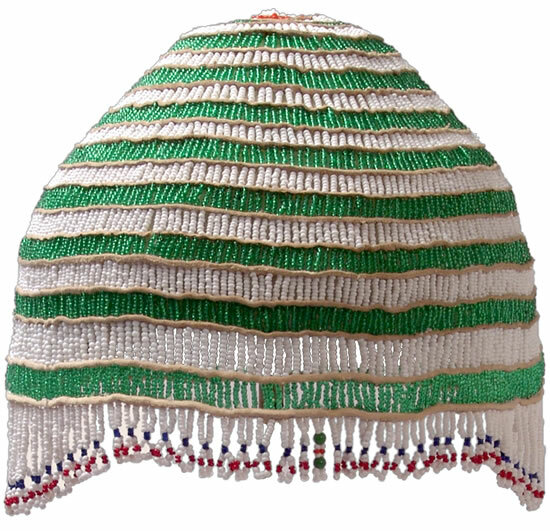 Dance headdress worn by young girls to keep their caarrluk (dust and scent) from injuring others. 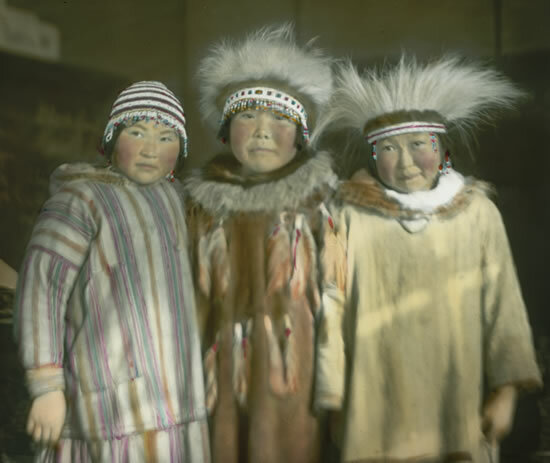 Frank Andrew said: "Girls always wore those beaded hats, even though they weren't dancing. Their hair never flew around because those people were never careless, letting their hair get everywhere." 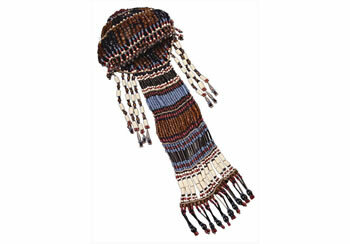 Dance headdress for special occasions, heavy with valuable trade beads. 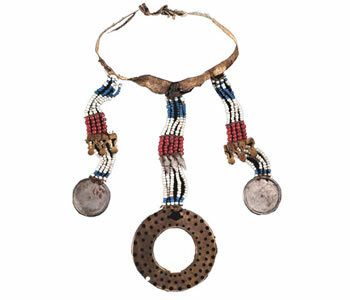 Chest decoration made of beads, box covers, and pieces of an oil lamp, worn by a woman over her parka and around her neck during dances. 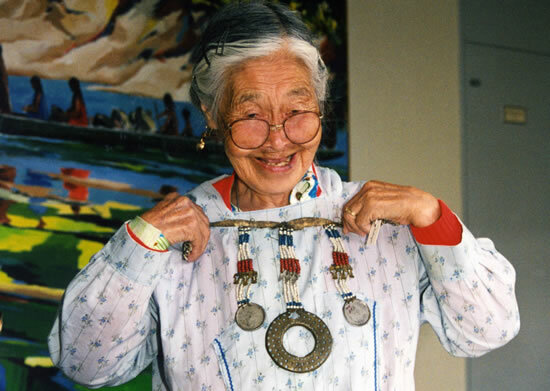 Holding up the Nushagak ornament, Catherine Moore commented: "I'm looking at a manumik, my goodness. These were given to older girls. I used to hold one and rub my hands on it, wishing I could own one like it." 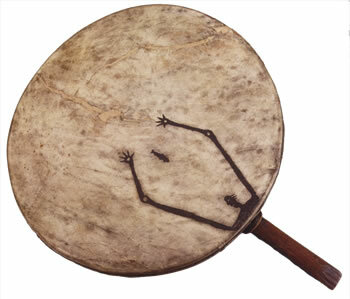 Cauyaq/Drum with bird head handle, used for dancing. Frank Andrew explained: "When they were not using drums, they removed the walrus stomach covers and stored the rims in caches. Drums were handled with care." 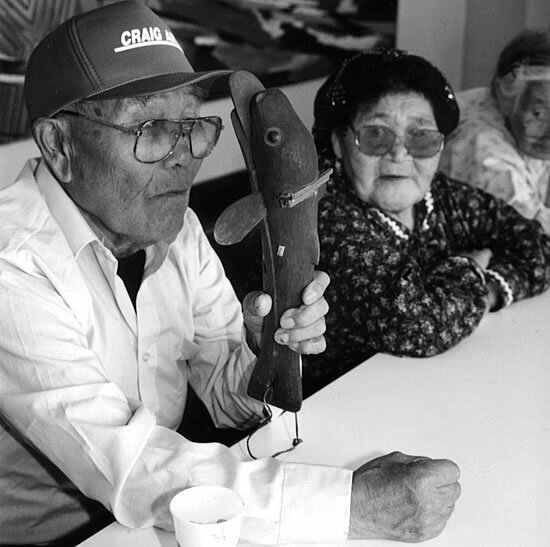 Paplu/Drum handle shaped like a fish, from Nushagak. Collector J. 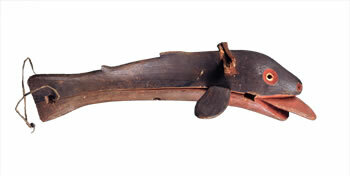 A. Jacobsen wrote that a shaman might have used the small stick fastened to the handle to call his helping spirits and ask for their assistance. Wassilie Berlin demonstrating the drum handle's use at the Ethnologisches Museum Berlin, 1997. 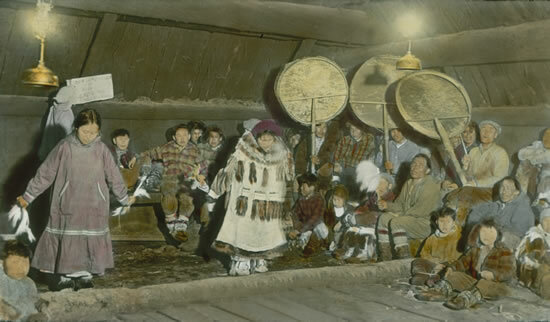 Dancers in a Bethel qasgi in the 1930s. Copyright 2008-15, All Rights Reserved. No Replication of Images or Design without Express Written Permission.